Some women like a man in a uniform. I have a thing for Le Mutts. I like to travel with a Le Mutt. Le Mutt is the best stuffed animal ever made bar none. Our older Le Mutts (Père and Fils) were getting a little ratty from world travel and from sleeping with my husband when Plumpton was under the weather, so I arranged for them to have a day at the spa conveniently located in the basement of our home. First, the Le Mutts went for a long soak in the washing machine hot tub. Mugging for the camera in the rinse cycle. The Le Mutts relaxing after a vigorous workout. The old gent on the left is Le Mutt Père . Thoroughly dried and ready for grooming which in this case means restuffing, sewing and fluffing. I took this picture with the assistance of my equally zany husband. 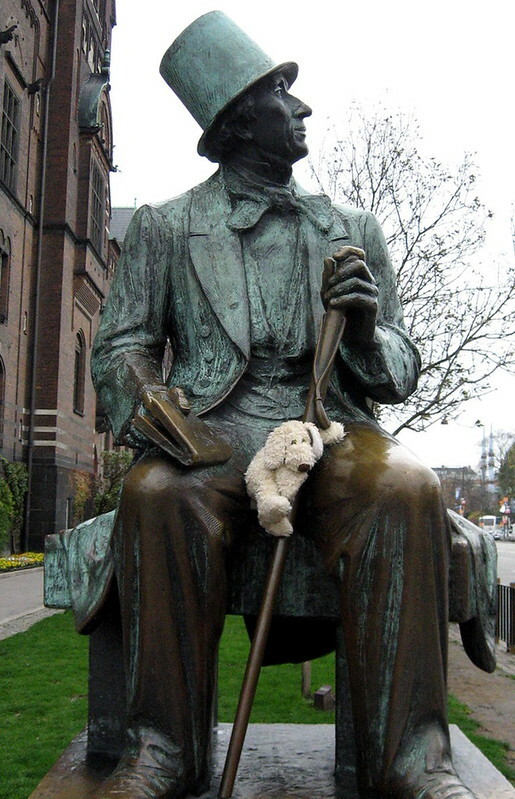 We had wait for some other tourists to snap their pictures in front of the statue of Hans Christian Anderson. When out turn came, a dour looking man loaded down with camera equipment huffed impatiently while I posed and reposed Le Mutt . My husband apologized explaining that the dog was a difficult model to work with. The man failed to see the humor in the situation. He’s lucky Le Mutt didn’t bite him. Marty…You are so silly! I love you, Cuz!